The two blue parrots and their owner are a familiar sight around Mayfair, I introduced you to them here. 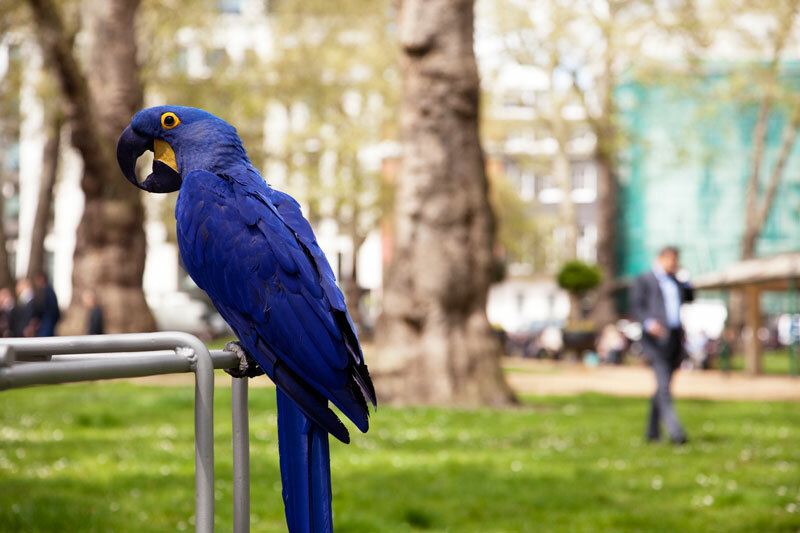 Yesterday they were having an outing in Berkley Square and were very reluctant to be photographed. They turned their heads away or their their backs toward me. Pecked my camera strap and yanked at my scarf. Any picture I took of the two of them appeared to only have one head. Finally, "ok you have one second, make it quick". oh that's funny! what a beautiful bird! Such a vivid and beautiful shade of blue!! Awesome! Nice looking little guy. What a brilliant colour and such a gorgeous bird. He is such a gorgeous blue! Feisty little creatures they are!! I'm glad you finally managed to get a photo of one of them, he's beautiful! Great shot with fantastic color and detail.